Welcome To Kelly Greens Golf & Country Club. A Premiere Private Gated Golfing Community. Proudly Presenting Our Newly Updated. Par 72. Gordon Lewis 18 Hole Championship Course. Expanded & Remodeled Restaurant, Grill & Club. 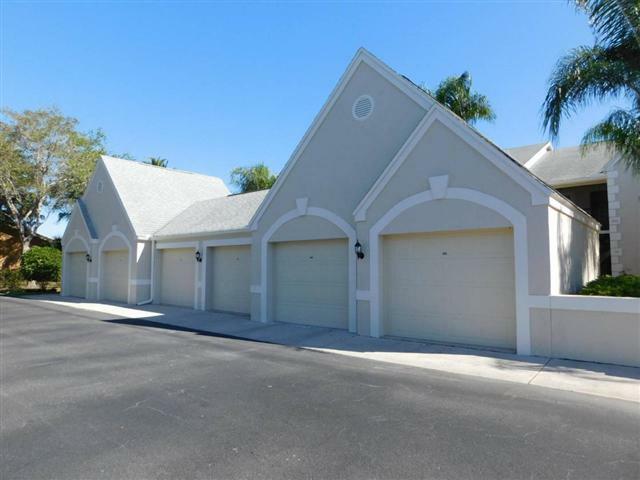 Great South Fort Myers Location Close To Shopping. Dining. The Beaches & Sanibel Island. Offering One Of The largest Of The Veranda Floor Plans. Featuring Over 1,300 Feet Of Living Space. 2 Bedroom. 2 Bath. Front And Rear lanai's. Detached One Car Garage With New Hurricane Rated Door. Pull Down Stairs For Extra Storage. Interior Updates Include. Updated Kitchen With Corian Counters. Custom Cabinets With Pull Out Drawers. All Appliances Have Been Replaced. Both Baths Updated. Italian Tile In Kitchen, Baths & Lanai's. A/C & Lines Replaces Approximately 2 Years Ago. Electric Shutters Through Out!. Offered Furnished. Master Fee $ 4,792. Annually Paid Quarterly. Maintenance Fee: $ 1,278. Quarterly. 2015 Taxes: $ 2,334. Buyer Pays One Time $ 5,000 Joining Fee At Closing.